Everyone who has heard of the Mahabharatha knows about Karna. He was known not just for his prowess in war and his skills in archery, but for his habit of donating whatever anyone asked of him. That’s why he was known as Daanveer. There are a few stories in the Mahabharatha that clearly reveal what a generous soul he was. Once it so happened that Arjuna asked Krishna why he is called the Danveer and Yudhisthira the Dharamraj. As always, Krishna just smiled and did not say anything. He disguised himself and Arjuna as Brahmins and paid a visit to Yudhisthira first. He asked for sandalwood to cook food. Yudhisthira tried his best to procure dry sandalwood, but since it was raining heavily, he could not. He apologized profusely to the ‘Brahmins’ and they had to return empty handed. The next visit was obviously to Karna. Krishna demanded the same thing of Karna too – dry sandalwood. Karna too could not find a dry log of sandalwood. But he did not turn the Brahmins away with an apology. He cut down the doors of his palace that were made of sandalwood and handed the pile of wood over to the Brahmins. Arjuna was rendered speechless, to say the least. 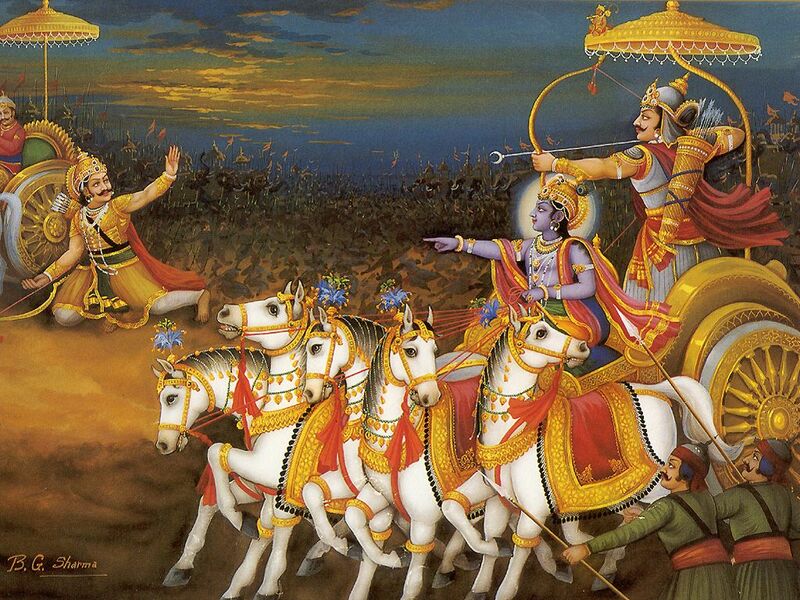 Though Krishna was very close to Arjuna, he admired Karna a lot and used to praise him a lot in front of Arjuna. Arjuna was not much pleased with this and asked Krishna why he did so. In response, Krishna turned two mountains into gold. He gave one each to Karna and Arjuna and told them to divide the gold equally with the nearby villagers. 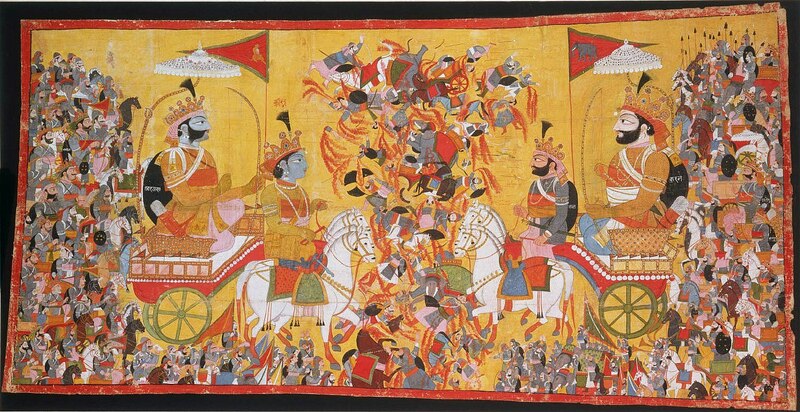 Arjuna in a quest to prove to Krishna that he was better than he began to dig the gold from the mountain and began to divide it among the villagers. No matter how much gold he dug and gave away, the mountain remained the same and did not reduce a bit. Arjuna started feeling tired. In the meantime, Karna called two villagers and told them to divide the gold equally among the villagers and went on his way. 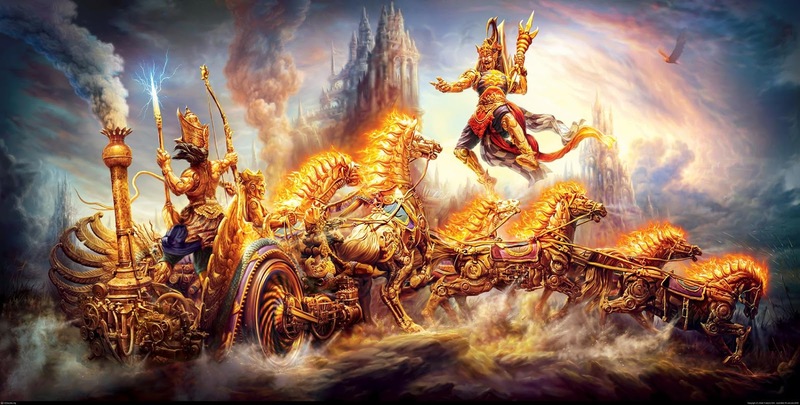 The omniscient Krishna explained to Arjuna what had happened. He said that Arjuna was not giving away the gold willingly as the villagers had not done anything to deserve the gold. He also wanted to be the one giving away the gold. Karna, on the other hand, did not care about the gold and just gave it away without a moment’s hesitation and walked away. Duryodhana too was jealous of the fame of Karna as a Daanveer. So heeding the advice of his Uncle Shakuni, he tied a dharm daja (flag) and started donating to people. He told the people to go around and tell everyone what a great Daanveer he was. Karna, on the other hand, did not care about any fame or name. So the people still said good things about Karna. As was his way, Lord Krishna took the guise of an old, ugly looking Brahmin with blood oozing out of his body in many places and went to Hastinapur to meet Duryodhana first. When Duryodhana asked him what he wanted, he said that he was going on a yatra (journey) and that he wanted to go on foot. He also said that he wanted to switch bodies with Duryodhana with a mantra he knew so that he could have a healthy body to walk with. He also said that once he completed his yatra, he would give back his body to him. Duryodhana immediately replied that he would have to ask his Banumati who was the master of his body, first. Banumati on seeing the ugly old Brahmin screamed and shouted at her husband how he could even think of switching bodies with the ugly old man. She also asked him to take down the dharm daja and stop giving away gold. Krishna went away saying that Duryodhana should not pretend to be daanveer anymore. He then went to meet Karna and put forth the same demand to him. Karna did not hesitate even for a single moment. He offered his body to the Brahmin instantly. But Krishna in the guise of the Brahmin said that Karna has to seek his wife’s permission. Karna replied that to do good deeds, one need not seek the wife’s permission. But when Krishna insisted upon it, Karna sought his wife’s permission. Karna’s wife also did not hesitate and told her husband that he could go ahead and give the Brahmin his body. When Krishna asked her why she wanted to switch her husband’s body with such an ugly body, she calmly replied: Please accept my husband’s body. When you go on a yatra with my husband’s body, it will be purified. In the meantime, I will be able to take good care of your body as well. When he offered Karna a boon, all he asked was his Bhakti and to see him at his death. Karna’s wife too wanted the same. Lord Indra, Arjuna’s father was apprehensive about Karna’s phenomenal skills as a warrior. He appeared before he disguised as an old Brahmin on the eve of the Kurukshetra war. Then he asked him for his Kavach(armor) and Kundal (earrings) in daan. Indra, therefore, asked this daan to reduce Karna’s strength. In spite of being cautioned about his by his father Surya, the ever generous Karna tored off his Kavach and Kundal off his body and donated them to Indra. Lord Indra was immensely pleased with his generosity and blessed him. In an ultimate test of his daan, Krishna, disguised as a beggar, came to Karna when he was on his death bed and asked for alms. Karna who did not have anything with him and asked the beggar to go to his wife and get anything he desired. However, the beggar indicated that Karna had a golden tooth. He immediately took a stone and broke his golden tooth and offered it to the beggar. However, the beggar said that the tooth was dirty. He shot an arrow and made it rain and washed the tooth and gave it to the beggar. Lord Krishna who had appeared as promised earlier at Karna’s time of death blessed him saying that he would always be remembered for his daan and veer. Thus Karna was always such a generous soul who did not hesitate in giving to others what he had. Is Karna your favourite character from Mahabharatha too? Comment in the space below. Yeah very interesting. Mahabharatha itself very nice mythological story which is good to read.